Twitter Lists Are Live - And Now Introducing Listorious! Twitter Lists Are Live – And Now Introducing Listorious! You should now have access to the new Twitter Lists function. Just login to your Twitter profile and go to your “Home” page. You should see the Twitter Lists feature at the top. 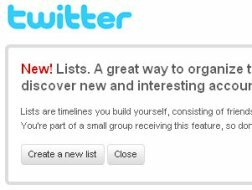 And now that you have Twitter Lists available, you might need some help creating high quality lists to follow. Well guess what? You’re in luck… TechCrunch just wrote a great article featuring Listorious, the seemingly authoritative site that has already put together great lists to follow with just one click. “But how do you find the best lists? Already, there is an independent directory service which is launching in tandem with Twitter Lists called Listorious. (Warning: it only fully works for people who have Twitter Lists enabled). Listorious offers a curated collection of lists across various categories such as media, humor, marketing, finance, and food. You can see the most popular lists, ranked by how many people follow them. It is also possible to search by tags, or just search lists in general. So check out Listorious and get started on building high quality lists to follow!